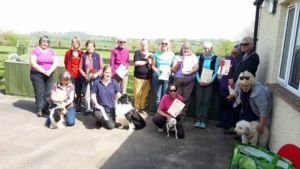 I agreed to “manage” this trial for Pat Somerset to see if the venue was suitable for scentwork uk trials and I think everyone who attended would agree that it worked very well. Faye Sparkes our judge set hides appropriate to a level 1 with several first time competitors and did an excellent job of putting people at ease, so thank you Faye for your time. First time scribe Jean and first time runner Ann were both excellent and genuinely enjoyed their day. Ann’s help with the totting up and working out the placings at the end was appreciated especially as neither of us had a calculator, good old pen and paper, we did have the odd giggle and it was a good job there were two of us double checking each others maths. Anyway it all worked out well in the end. Lastly a big thank you to the competitors and I hope you all enjoyed your day. A lovely trial was held at Wellington on Good Friday. All competitors did well. And the dogs worked well. I hope everyone had a good day and took on the advice for future trials and classes. To advance your scentwork knowledge. I would like to say thank you to Jean for being my scribe. And Ann for being a runner getting competitors to the correct places. The venue worked well for this Level 1 trial, thank you for Pat for hosting this trial and asking me to judge. Along with Pippa for being trial manager. Entry Fees: £21 per dog. Entries capped at 15. Only one dog per handler.